Hana (Aoi Miyazaki) works hard to balance her job and her studies at university. At uni, she meets a man, they fall in love and have two children – Yuki (Haru Kuroki) and Ame (Yukito Nishii). But there is something special about him: he is a wolfman, and so Yuki and Ame also are half-wolf. 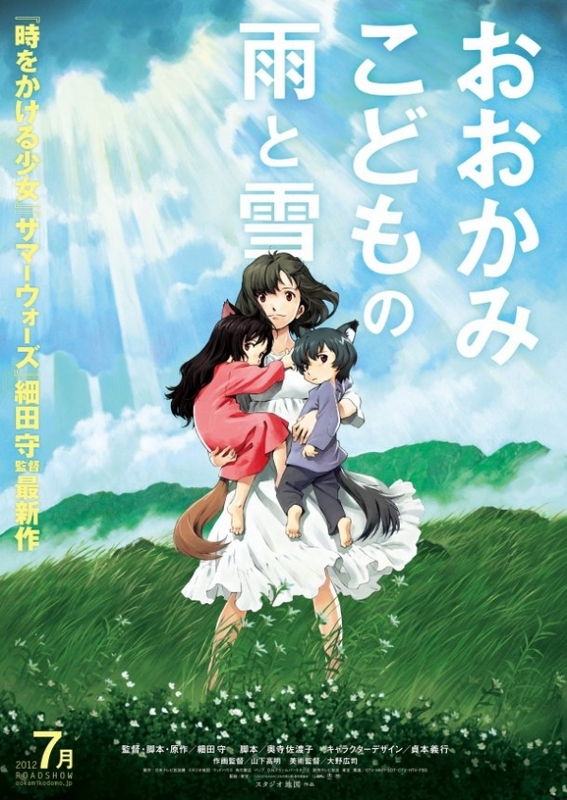 And then one day, the father doesn’t return and Hana is left alone with two children she has to take care of all of her own since nobody can know their secret. Oh boy, do I have ISSUES with this movie! Not only does it tell its story with a megaphone, no matter whether it should be whispering at the moment or maybe talking at a normal voice, the message it screams out that way is completely offensive to women. Lola (Jessica Monceau) lives in an unfinished painting. 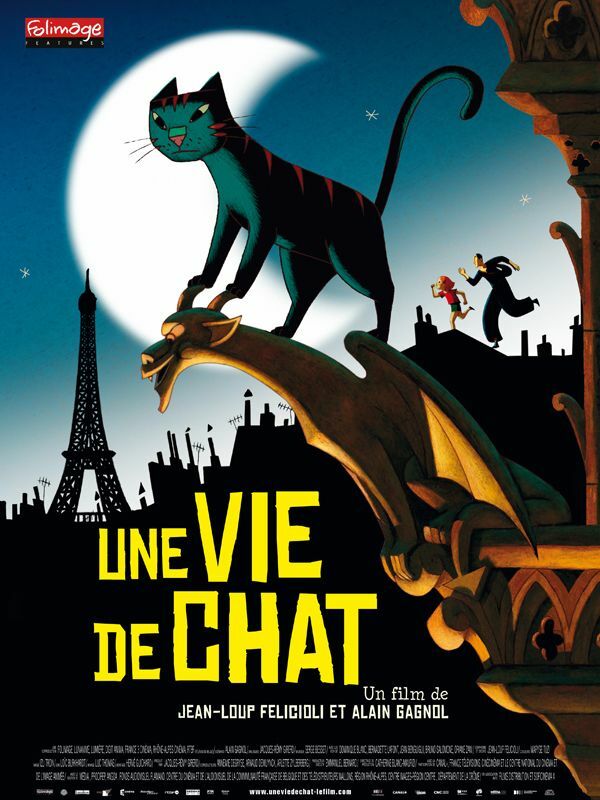 In that painting, there’s a definite hierarchy: the finished characters live the good live, while the half-finisheds like Lola live more or less in hiding. Though they are still lucky compared to the sketches who get hunted down. Lola’s best friend, half-finished Claire (Chloé Berthier) is in love with the finished Ramo (Julien Bouanich) and vice versa, a love that is frowned upon strongly. As circumstances will have it, Lola, Ramo and the sketch Plume (Thierry Jahn) find themselves on the run from the finished – a flight that leads them right out of the painting and on an adventure to find their painter and ask him to finish them. 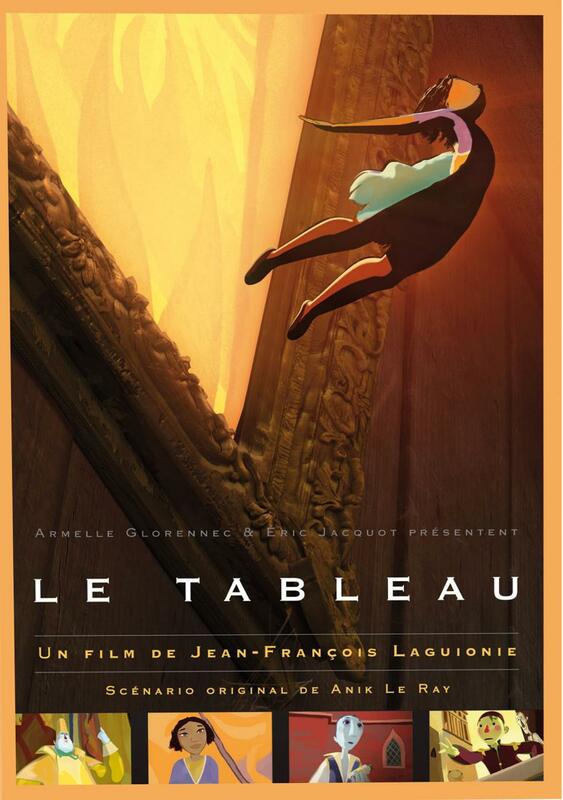 Le tableau has an intriguing premise but unfortunately the movie just doesn’t deliver. Anything. It was badly drawn, badly animated, badly spoken and badly written. I actually fell asleep during the screening – and rarely have I been so glad to miss out on half an hour of a film. Leonard (Michael McGinley) and Mary (Donna Kozloskie) are a bit of an eccentric couple. Leonard works in a hardware store and is a passionate home improver – he basically built his house from scratch. Mary sells songbird eggs at the local market. But then Mary is diagnosed with cancer. And Leonard starts re-building the house in the belief that he can transform it into a healing machine for her. The movie is an eccentric piece of filmmaking. It’s a stop-motion animated fictionalised true story that is already a little weird and is only made stranger by the way it’s told. It’s an ambitious project that fails in some regards, but in others it’s a win. Czech Republic, 1989. 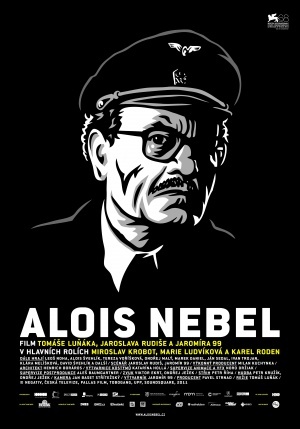 Alois Nebel (Miroslav Krobot) is a dispatcher in a small village close to the Polish border. He is generally content with being alone and not having to talk much, but sometimes he starts hallucinating and basically the whole of Czech history seems to come to his trainstation in his hallucinations. But Alois can’t cope with this and finally ends up in a sanatorium where he meets the mysterious Mute (Karel Roden), who carries his own piece of the past with him in the form of a foto. This movie was dominated by the absolute boredom it ellicited in a 5 km radius. I tried so hard, but I just couldn’t keep my eyes open after the first half hour or so. Asuna (Hisako Kanemoto) spends most of her time alone on a near-by mountain where she has a hide-out and a self-built radio with which she tries to hear anything, really. But one day after school she gets chased by a monster and is saved by the attractive Shun (Miyu Irino). She finds out that Shun is not from our world, but from the mysterious underworld Agartha. 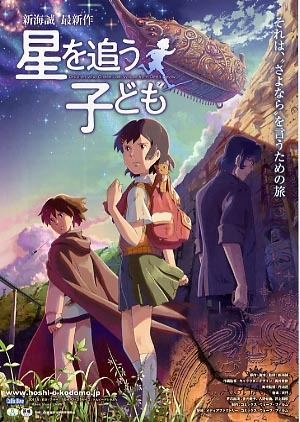 When Shun disappears, Asuna and her teacher Mr. Morisaki (Kazuhiko Inoue) follow Shun’s brother Shin (Miyu Irino) to Agartha and to a big adventure. The film has a few issues, but the film works amazingly well despite that, mostly because of the wonderful characters. It’s also beautiful and I was very and truly impressed by it. After the death of her father, Momo (Karen Miyama) and her mother (Yuka) move to the island her mother is from. Momo is torn up by her father’s death. All that remains of him is the beginning of a letter he wrote to her, stating simply “Dear Momo”. Since Momo’s mother is working a lot, Momo has basically all the time in the world to brood over that letter. But soon Momo notices that there are weird creatures living in her attic that nobody but her seems to be able to see. Even though these yōkai cause many problems for Momo, she starts to befriend them. 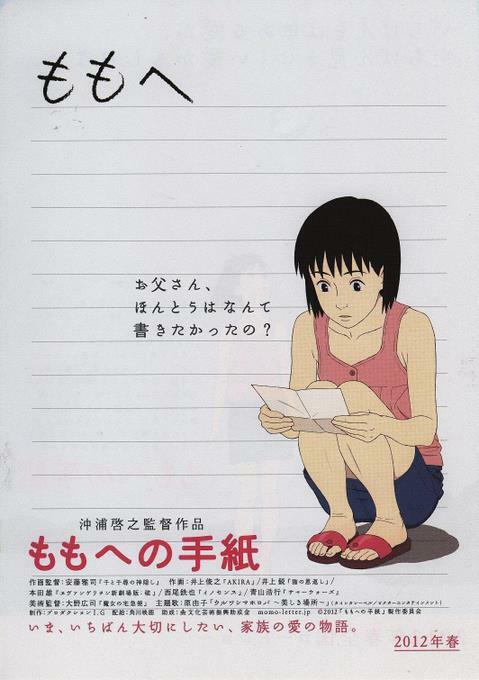 A Letter to Momo is a wonderful, cute, beautiful, extremely sad and very conciliatory film. I absolutely loved it. Algeria in the 1920s. 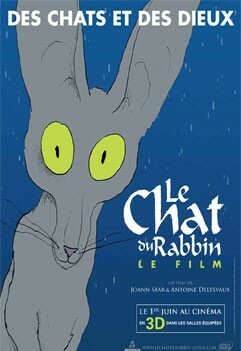 The local rabbi’s (Maurice Bénichou) cat (François Morel) starts talking after eating the family parrot. And since the cat loves nothing more than the rabbi’s daughter (Hafsia Herzi), he wants to convert to Judaism to be able to court her. But that is only the beginning of the rabbi’s and the cat’s adventures that leads them right across Africa. The movie is very funny, but it kinda ends in the middle of nowhere (literally and figuratively) and it has a few lengths. Nevertheless, it’s pretty excellent. The Secret of Kells is Tomm Moore‘s oscar-nominated animated movie, starring the voices of Evan McGuire, Christen Mooney, Mick Lally and Brendan Gleeson. Brendan (Evan McGuire) lives in a small village in medieval Ireland, where he helps his uncle Abbott Cellach (Brendan Gleeson) build fortifications to keep the Vikings at bay. But when the famous illustrator Aiden (Mick Lally) turns up with his cat and a very important book, Brendan discovers not only the wonders of the woods outside the village walls, but also his talents as an illustrator himself. 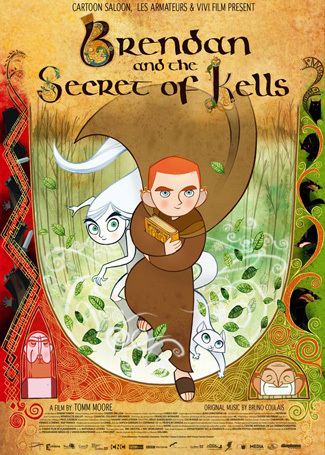 The Secret of Kells is magical. The main attraction are certainly the visuals and they are absolutely wonderful. So perfect, in fact that I didn’t even mind the religiousness of it all (which is generally rather unobtrusive but you can’t deny it’s there). 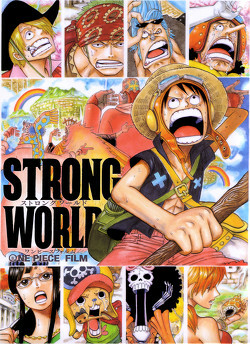 One Piece: Strong World is the tenth One Piece movie (made for the tenth anniversary of the show). It was directed by Munehisa Sakai and written by creator Eiichiro Oda. The Straw Hat Pirates meet the evil pirate Shiki. When Nami can warn him about an oncoming storm nobody else sees, he decides that he has to have her as a navigator. So he kidnaps her and leaves the rest of the crew stranded on a few floating islands that boast the weirdest – and most aggressive – wildlife. I have never watched or read One Piece before, and I have to say that this movie did not make me want to watch it. 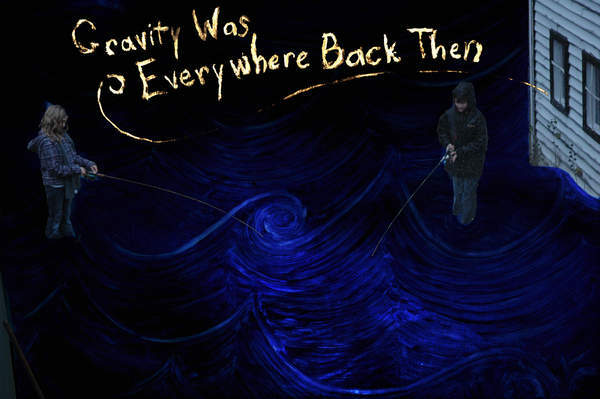 It was perfectly fine, even though a little ridiculous, and I had no problems following it, though I knew nothing about the show*, but it just didn’t float my boat.